You know, some convenience is ok and some is not. Let me give you an example. Salad in a bag or box is quite convenient. Who wants to waste time chopping up a salad? Shredded cheese in a bag is also convenient. Who wants to do that? But then manufacturers take it too far. This whole Smucker’s Peanut Butter and Jelly sandwich with the no-crust bread that sort of looks like a round pie is taking it too far. I won’t belabor on that one; it’s been discussed over at Memarie Lane’s blog quite well. Check it out here if you are curious. Who comes up with these notions that since many people like pancakes and sausage for breakfast that they could create a sausage on a stick and wrap a pancake around that like a corn dog from hell? 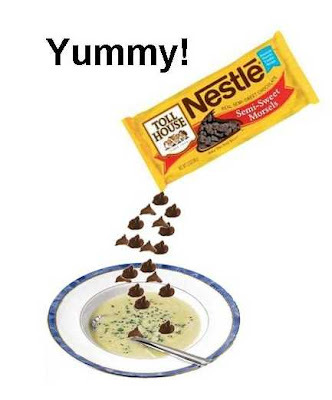 Oh, and what stupid committee executive suggested adding chocolate chips to it? Of course chocolate chips are yummy and go with everything, right? I always sprinkle a few into my morning Pepsi and they’re delicious in soups and yogurts! Wow, the PB and J thing was not a VE joke, but a real product. I am scared now. I do like "Goober Grape" which combines PB and J in one bottle, but I can do my own spreading. I likes me a little piggie in a blanket now and again...but they lost me with the chocolate chips. 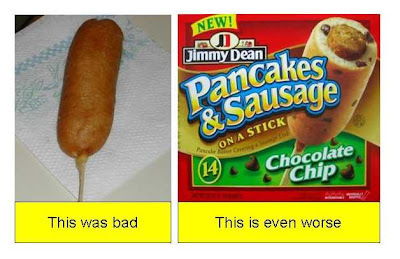 I actually think the corndog from hell looks pretty good, but not with chocolate chips. Keep in mind though, I AM pregnant. It's not really convenient if it's something you would never do. It's just nuts! Do you know where I could find some peeled grapes? kan - I know, it really is getting hard to tell what is real and what is a VE joke now. I don't know that Peanut Butter and Jelly should co-mingle that long. That seems wrong. marie - Clearly the chocolate chips idea was a 'committee' decision because nobody seems to want them...that's what committees do...come up with things nobody wants. Oh, and refrain from the lure of the corn dog! Bad marie! red mojo - Ewww, imagine how slimy a bag of peeled grapes would be? That's just wrong. kurt - I have been to Japan but I guess I spent too much time getting lost on the subway there as I never saw those! Nice jab back...again. Those little burgers are goofy; so Japanese like. Good Lord, those sausage/pancake on a stick thingees look disgusting. 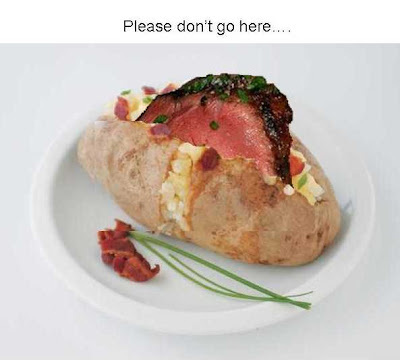 Wait a minute... what's so bad about a steak-stuffed potato? That's sounds awesome. jacki - Thanks for stopping by. Yeah, I'll bet they taste even worse! 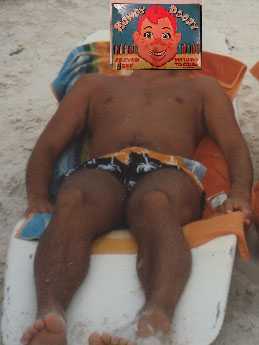 jeff - You've been out in the cold too long again, haven't you? sj - Yes, everybody does have a PBJ ratio, don't they? Oh please, save us from such monstrosities. Give me a good plate of Spanish ham, a nice glass of wine, and forget about the rest of that crap. I have stuffed my homemade burgers with cream cheese and green olives. It's pretty good. No, really. Cheers!! theresa - That's not a green ham is it? 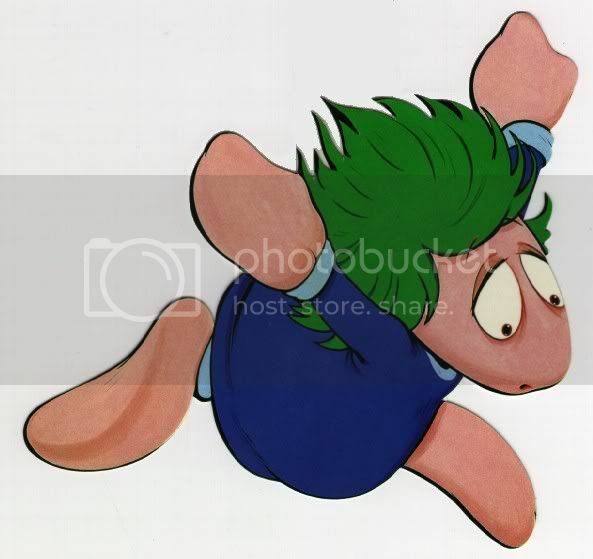 gaggaggag @ the corndog blanket pig! christine - Gross is as gross does! I love the steak growing out of the potato!Yummy! Say a prayer my lovely VE, your innocence will soon be lost as was mine. uncivil - Yeah, can't you see THAT at dinner?